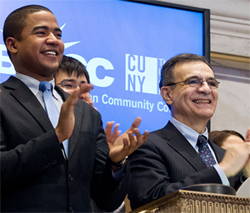 Dr. Antonio Pérez, Borough of Manhattan Community College (BMCC) president (center), rings the Opening Bell of the NY Stock Exchange along with representatives from JPMorgan Chase, the NYSE and students from BMCC. This year may just be the best year ever for Borough of Manhattan Community College (BMCC). 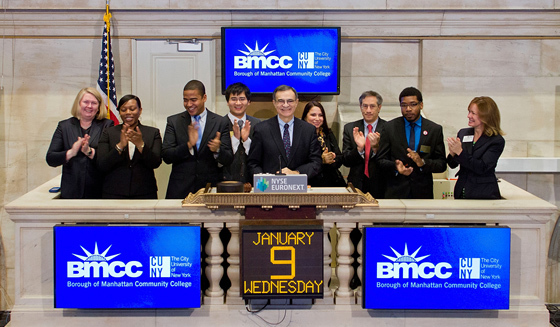 On Wednesday, January 9, BMCC representatives rang the Opening Bell of the New York Stock Exchange in celebration of the college’s 50th anniversary and the recent reopening of its beloved Fiterman Hall. BMCC President Dr. Antonio Pérez was joined by enthusiastic colleagues and students, including the college’s Foundation Secretary/Treasurer, Laura Morrison, and Student Government President Andrew Grant. BMCC student Jorge Minor and BMCC President Dr. Antonio Perez celebrate the ringing the Opening Bell on the NY Stock Exchange. Initially housed on two floors of a commercial building, BMCC has flourished since its founding in 1963. 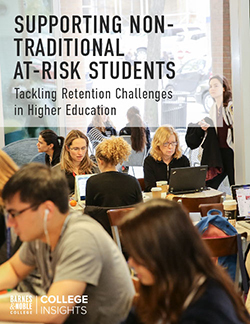 Now the largest undergraduate school in New York City, the college educates students from over 155 countries in three thriving locations, including a main campus that impressively spans four city blocks. As a fixture of lower Manhattan, BMCC was hit especially hard by the attacks of September 11th. Although all students and faculty were successfully evacuated, the college lost one of its own buildings that day. Built in 1959, Fiterman Hall sat on land once occupied by Kings College, founded in 1755. This history made the site “the first home of higher education in New York City.” Donated to BMCC in 1993 and under construction for eight years, the building was nearly ready for classroom use when Building 7 of the World Trade Center collapsed upon it.